Good timing! This place has just been getting a second wind as we speak! Hi there! 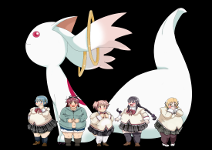 We are doing our best not to let this forum to die so you are not alone anymore~As long as I am connected to the net there be much Madoka-centric talk here~Do you like other anime/cartoons beside Madoka? Thanks guys for the welcomes! To answer your question SockPuppet I love lots of other animes as well. To name a few I'm really into Love Live and Love Live Sunshine,Senki Zesshou Symphogear,Tenchi Muyo,Code Geass, and Steven Universe (I know its not a anime but it might as well be). But I love lots of other shows as well and I always love to chat. If Cory in the House (XD JK) can count as an Anime, I don't see why Steven Universe can fit in the picture. Ditto for Avatar: The Last Airbender (and its sequel series, The Legend of Korra). Great~Basically in Japan every cartoon is anime but in the outside (outside Japan) world they usually call 'anime' only Japanese cartoons. But it's not like it's a rule. I don't watch SU but I find the idea interesting (I more or less know the main concept of the show for it's sooo popular on tumblr) even fascinating. Also many people claim that PMMM and SU have much in common.